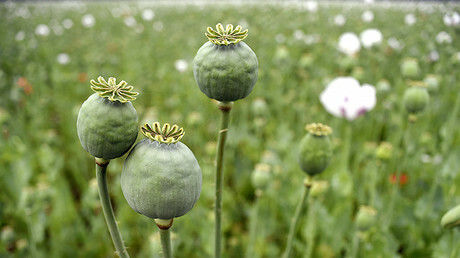 Undercover deputies in Catawba County, North Carolina stumbled on a field of opium poppy plants while conducting a separate investigation. The property owner, Cody Xiong was charged with manufacturing and trafficking opium, both felonies. An undercover sheriff deputy was at Xion’s property conducting a warrantless “knock and talk,” following up on a tip about another matter. Xiong opened the door, saw the investigator on his porch, and immediately confessed. “I guess you are here for the opium,” Xiong said, according to the Washington Post. The investigator wasn’t, but he was intrigued. Behind Xiong’s home investigators discovered a field of poppies with its bulging seed pods planted in tidy rows and obscured by trees. The poppies will have to be weighed to determine the exact value of the haul, but authorities estimate there were about 2,000 pounds of poppies in all, valued at an estimated half-billion dollars. Police also confiscated multiple firearms and ammunition. “Poppy plants in Catawba County and North Carolina is something new to the area, and they’re planted in rows of other vegetables being grown here. He knew what he was growing,” Reid said. The farm was well hidden at a dead-end gravel road in the rural foothills, forty miles from Charlotte. It took 10 deputies and SBI agents to pull up the field of poppies. Reid’s investigators think the plants were being grown and harvested and then shipped elsewhere to be turned into heroin. Xiong was charged with manufacturing a Schedule II drug and trafficking in opium, both felonies. He was arrested and released on $ 45,000 bail. He could not be reached for comment and it’s unclear if he has a lawyer. The investigation into Xiong’s operation now involves DEA agents. The sap from the seed pods of opium poppies is extracted after slitting the bulb, according to a PBS “Frontline” story on the drug trade. Then, the jellylike fluid can be combined with other chemicals to produce a range of opiates including morphine, codeine and heroin. There are many varieties of poppies, often distinguished by their bright flowers; among them, the opium poppy, or Papaver somniferum – the only one that’s illegal to grow. Claremont, where authorities made the bust, has a population of roughly 1,400 people, according to the census. It is about an hour’s drive northwest of Charlotte, the state’s largest city.